You'll be £15.99 closer to your next £10.00 credit when you purchase Walking Ypres. What's this? The medieval city of Ypres will forever be associated with the Great War, especially by the British. From 1914 to 1918 it was the key strongpoint in the northern sector of the Western Front, and the epic story of its defence has taken on almost legendary status. The city and the surrounding battlefields are also among the most visited sites on the Western Front, and Paul Reed's walking guide is an essential travelling companion for anyone who is eager to explore them. His classic book, first published over ten years ago, is the result of a lifetime's research into the battles for Ypres and the Flemish landscape over which they were fought. For this second edition, which he has revised, updated and expanded, he has provided new photographs and included two entirely new walks covering the Langemarck battlefield where the 'Last British Tommy' Harry Patch fought and also the Potijze area. 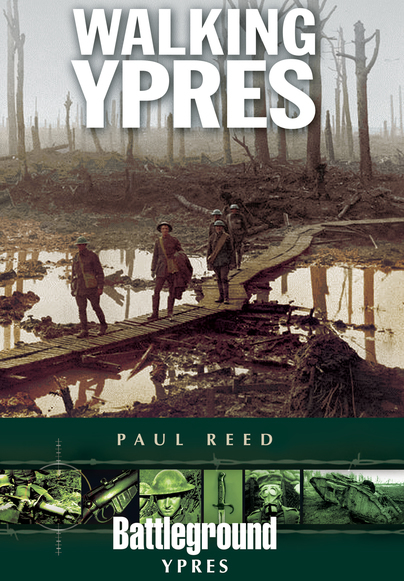 With four years of fighting around Ypres there are a plethora of sites that can be visited, however Paul Reed manages to pick a selection that highlight the key events and places in the salient and give a well-rounded view of the course of the war in the area. It will certainly be a book that I pack on my future trips to the battlefields. The detailed guide, added to the stories, the maps and the photos give you an excellent idea of what you will find, and all in a format that is so convenient to keep in the car or a backpack if you visit the area. Definitely a book I will take with me on my next trip and certainly one I would recommend. When visiting Ypres, this book must be taken with you.